The city of Oakland is having a cultural moment right now. Ryan Coogler and Boots Riley made two of the most memorable movies of 2018, and I, as someone who has never been to Northern California, have found myself thinking and reading about it more on its own–separate from San Francisco or the rest of the Bay Area–than I ever have before. Oakland appears to be a city that is going places, but its professional sports teams are leaving it behind. The Warriors are moving to San Francisco, but at least they are staying in the area (and it’s not like baseball and football where San Fransisco and Oakland have each had their own teams), and they have been sending off Oakland with some of the best basketball any team has ever played over a five year span. The Athletics long-term future is uncertain. Their current stadium situation is one of the worst in Major League Baseball, and there is no plan right now for a new ballpark. When they do get a new one, it might be in San Jose, or it might be even farther away than that. But for now, the A’s are a playoff team, and will be in Oakland in 2019, so it’s not the worst case scenario just yet. The Raiders are moving to Las Vegas next year. When owner Mark Davis announced the move in 2017, the Raiders were coming off their first playoff season in over a decade, and it really looked like they could at least send Oakland off in style like the Warriors were doing, even if they were something of a long shot to unseat the New England Patriots in the AFC. The added Oakland native Marshawn Lynch to a team with a good young quarterback in Derek Carr, and a defense with the potential to improve, built around franchise cornerstone linebacker Khalil Mack. It didn’t go well. The Raiders went 6-10, and fired head coach Jack Del Rio. Their big step forward in 2016 was immediately followed by two steps back heading into their final Oakland season. They hired Jon Gruden out of the ESPN broadcast booth to be their new head coach, signing him to a 10-year, $100 million contract. Sure, the last time the Raiders were consistently good was when Gruden was their coach, but he last coached them in the Snow Bowl in Foxboro in 2002. He has not coached since the Tampa Bay Buccaneers fired him following the 2008 season, and aside from the 2002 team that beat the Raiders in the Super Bowl, his Bucs teams were mostly unremarkable. But when a famous coach that is on TV every Monday night who hasn’t coached in a decade is commanding a nine-figure contract, you have to do it, right? This isn’t the first time the Raiders have hired a former Raiders coach to coach the Raiders after a long time not coaching. Hall of Fame offensive lineman Art Shell coached the team from 1989 to 1994, and Al Davis hired him again in 2006, six years removed from his last assistant coaching job, and the team went 2-14 in Shell’s single-season second stint with the team. Shell lost touch with the trends of the NFL, and while Gruden has been watching a lot of film, it has been in the capacity of an analyst and pundit. Shell was more recently in a coaching meeting than Gruden was when the Raiders rehired him this year. 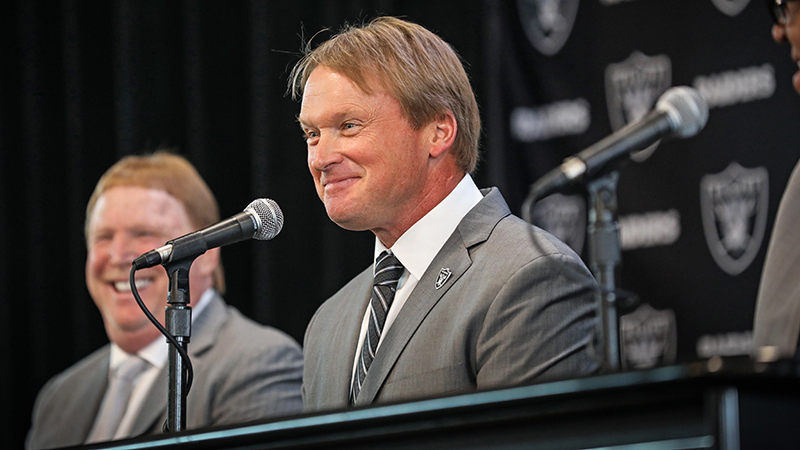 Gruden’s moves so far do not strike confidence in his ability to adapt to the modern NFL. In March, the Raiders cut 2016 All Pro punter and social media darling Marquette King, and he subsequently signed with the AFC West rival Denver Broncos. King, only the fifth African American punter in NFL history, apparently rubbed Gruden the wrong way. Something about punters with personality and swagger was bad for the culture, but Gruden seems to have forgotten that personality and swagger through the decades was what made the Raider the Raiders at their best. Last week, Gruden’s regime set the Raiders back even further when they traded Khalil Mack to the Chicago Bears because they did not want to pay him his worth in a contract extension. So much for the defensive cornerstone. The Raiders were never Oakland’s most loyal team. Al Davis moved the team to Los Angeles in 1982, winning their most recent Super Bowl as an LA team, and moved them back to Oakland in 1994. Since Al’s passing in 2011, his son Mark tried moving them back to LA, and flirted with a move to San Antonio. But when the Rams and Chargers both got approved to go to Los Angeles, he set his sites on Las Vegas. It was always more about “The Raiders” than their home city. Loyalty aside, the Raiders were also Oakland’s most culturally important team. The Silver and Black is the coolest uniform in the NFL, and even through their struggles, there are Raiders fans everywhere. Surely there are fans who followed the team to Los Angeles, back to Oakland, and will still follow them to Vegas. They could put the Raiders on the moon and as long as there are still TVs and couches, they will have fans. Perhaps this is part of a master scheme by Mark Davis and Jon Gruden. Maybe they are intentionally angering Oakland’s fans with these moves. Maybe the plan all along was to get through 2018 with such a depressing campaign that no one in Oakland will even want a football team anymore. At this point, with this franchise, I rule nothing out.